Your family might never know how much they like kale until they enjoy it in this hearty soup made with carrots, potatoes, tomatoes and lentils. This Spicy Lentil & Kale Soup is sure to become a new family favourite. Heat dressing in Dutch oven or deep large skillet on medium-high heat. Add carrots, potatoes and onions; cook 5 min. or until crisp-tender, stirring occasionally. Stir in garlic, bay leaf and paprika; cook and stir 2 min. Add water, broth, tomatoes and lentils; stir. Bring to boil; simmer on medium-low heat 30 to 35 min. or until lentils are softened. Stir in kale; cook 5 min., stirring occasionally. Discard bay leaf. Serve soup topped with cheese. Substitute smoked paprika or ground cumin for the paprika. 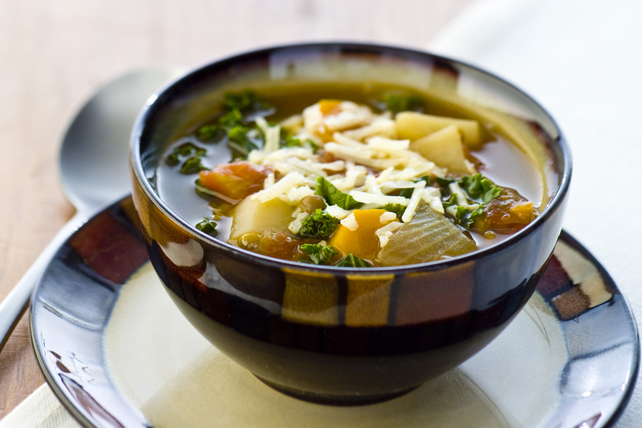 You're sure to savour the blend of flavours in this delicious soup. As a bonus, the carrots provide an excellent source of vitamin A and the kale an excellent source of vitamin C.